BEIRUT -- As the war in Syria continues unabated, the majority of Syrians surveyed in June and July see bleak prospects for the conflict ending soon. Fifty-one percent of Syrians see the conflict consuming their lives for at least one or two more years, while 30% see it ending in less than a year. Syrian and international aid organizations estimate that the conflict has displaced about 5 million Syrians from their homes nationwide; with an additional 2 million reported as refugees. If the conflict continues, as the majority of Syrians anticipate, the United Nations expects 3.5 million refugees to have fled the country by the end of the year. At this point, according to U.N. High Commissioner for Refugees Antonio Guterres, Syria has the highest number of displaced people anywhere in the world. Fourteen percent of adult Syrians consider themselves internally displaced persons, meaning they had to leave their home for any reason and now live in a different part of the country. Levels of internal displacement are comparable across the 12 governorates the survey covers. Two-thirds of internally displaced Syrians report relocating within the same governorate, while roughly one-third report moving to another governorate. Beyond themselves, 13% of Syrians report that their immediate family members moved somewhere else within the same governorate since the conflict started, while 12% say their families relocated to other governorates, and 5% report that their relatives left Syria altogether. In total, 37% of the Syrians surveyed are either themselves displaced or have immediate relatives who are either displaced in Syria or who have sought refuge outside the country. Perhaps more troubling to Syria's neighbors that have already absorbed many refugees, nearly half (47%) of Syrians say that if they could, they would relocate to another country. This is a substantial increase from the 29% who said they would like to move at the outset of the conflict in 2011. Despite being displaced and prevailing economic hardship, many Syrians are providing social support to those who have fled their homes. 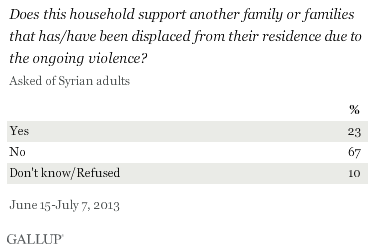 Close to a quarter of Syrians (23%) report that their household supports other families that have been displaced because of the ongoing violence. The spirit of aid among Syrians extends even to those who live outside their homeland. Fifteen percent of Syrians report sending help either in the form of money or goods to others living in Syria in the past 12 months, 7% sent help to others living outside Syria, and an additional 5% sent help to both. Similarly, since the conflict started, more Syrians have reported receiving help from others, either from those living in Syria or living outside the country, or from both. On average, the percentage receiving help has remained more than double what it was in 2010. Syria, historically a safe haven for refugees from other war-torn neighboring Arab countries, is now for the third year a profuse supplier of displaced families pouring into neighboring countries or scrambling to find a safe place within Syria itself. Gallup data suggest this tide is unlikely to ebb soon, as the majority of Syrians see no immediate end in sight, and half of Syrians would leave if they could. On his visit to Baghdad in late August, Guterres warned that the conflict in Syria is becoming a global threat. "With the recent escalation of the conflict, Syria could be on the verge of the abyss," he said. "Obviously we need to be ready for any escalation." While he stopped short of predicting the outcome that a possible Western military intervention in Syria could have on the refugee crisis, he advised neighboring countries to brace themselves for an influx of Syrian refugees. Results are based on face-to-face interviews with 1,022 adults, aged 15 and older, conducted in June and July 2013 in Syria. Homs and Quneitra governorates were excluded. The excluded areas represent approximately 9% of the population. In addition, almost one-quarter of selected primary sampling units were substituted as a result of the security situation. For results based on the total sample of national adults, one can say with 95% confidence that the margin of sampling error is ± 3.4 percentage points. The margin of error reflects the influence of data weighting. In addition to sampling error, question wording and practical difficulties in conducting surveys can introduce error or bias into the findings of public opinion polls. The personal toll of the Syrian conflict is evident in Syrians' diminished well-being and economic status. Sixteen percent say they have lost their main source of income because of the violence and 52% find it very difficult to get by. The slight majority of Americans -- 54% -- disapprove of the Obama administration's decision to send direct military aid to Syrian rebels fighting against the Syrian government, while 37% approve. A majority of Americans are not hopeful that the Syrian civil war will end through nonmilitary means, but more than two-thirds say they do not want the U.S. military to get involved to help end the conflict if diplomatic efforts fail.